The spectacle of mechanical slaughter came of age on the race tracks of Europe in the 1930s. This is the true story of a thrilling era in motor racing, a decade spotlighted by reckless speed and startling heroism. An epic tale of four men of exceptional skill and bravery racing in a time when the steel of Fascism was lubricated by the blood of men without nerves. A generation came to worship these icons to sacrifice: a generation taught how to live and die for nationalism and duty. ̶ Was Achille Varzi a morphine addict? Yes, there is no dispute that he was addicted to morphine. Where historians differ is (1) when he began taking the drug (most believe it was after his humiliation in Libya by Marshall Balbo) and (2) whether it was Ilse Pietsch who turned him onto the drug, or whether he fell under its spell during 1936 when he was taking painkillers for a stomach ailment. ̶ Did Varzi, Nuvolari, and Borzacchini fix the Libyan Grand Prix in 1933? Yes, there is little doubt these three drivers actively colluded to fix the result. What remains unknown is the extent of their collusion: the version told in Tracks, where the three chose not to race each other, is widely accepted as the most probable version. Whatever the truth, it is acknowledged that all three walked away millionaires from one of the most lucrative sporting swindles in history. ̶ Did Mussolini get personally involved with the Ilse Pietsch-Achille Varzi affair? Yes. Journalist Giovanni Canestrini (on whom the fictional journalist Johnny Finestrini is based), while never writing about Varzi’s addiction, was clearly in the know (given his now published letters to Varzi regarding his addiction), and probably worked with Minster of Foreign Affairs Ciano to revoke Ilse’s residence permit in Italy. ̶ What happened to Paul Pietsch? Paul Pietsch enjoyed a long and successful life: He died in 2012 at the unlikely age of 101, after having founded Germany’s premiere motoring magazine, Das Auto, after the war. ̶ Why the big steering wheels? The steering wheels were big not because the designers didn’t know the advantages of a small wheel: They were big because, holding on to them, was the only thing that kept the drivers of the day in their cockpits! The safest way of surviving an accident back then was getting hurled from the cockpit, so no restraining devices were used, which meant drivers holding themselves in the cockpit with feet firmly planted and hands gripping the wheel at 200MPH. ̶ How fast were those cars? A common misconception is that the cars of yesteryear were not that quick. In fact, by 1939, the Auto Union and Mercedes Benz were producing over 550BHP in cars that weighed under 800KGs! Speeds of 200MPH (340KMH) were common. ̶ Did America ever see these pre-war beasts in action? Roosevelt Raceway was a racetrack located in the town of Westbury in Long Island, New York, and was the site of the Vanderbilt Cup, a grand prix that was run in 1936 (won by Nuvolari in his Alfa Romeo), and 1937 (won by Bernd Rosemeyer in his Auto Union). The track has now vanished, the only remains being the name that houses a movie complex and shopping center. ̶ So why is the most iconic corner in all of motor sports named the “Caracciola Karussell”? The Nürburgring, the legendary 14-mile “Green Hell” circuit in Germany, hosted the German Grand Prix before the war. Of all its 73 corners, one stands out as possibly the most iconic turn in all of motor-sports … the Caracciola Karussell. It was named after Caracciola because the turn itself, now a banked turn, was never designed as such. 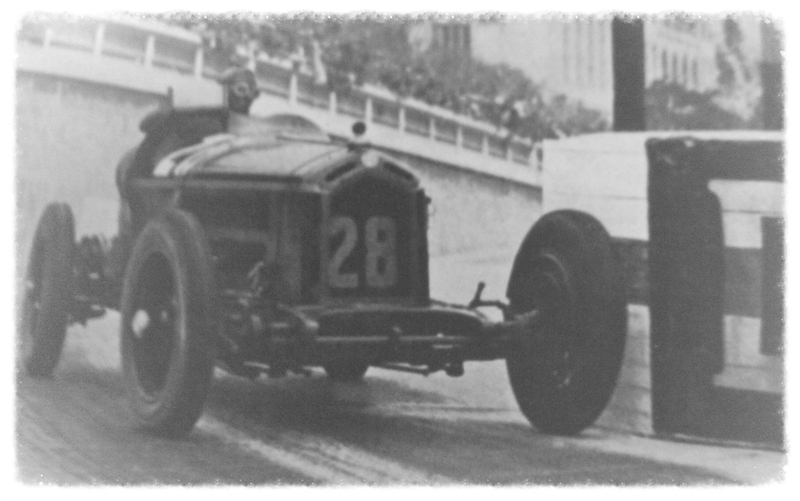 When Caracciola first ran the track, he realized that the banked dirt ditch on the inside of the tight left-hand hairpin was the quickest way around. Come race day, Caracciola used this line to win the race. Years later, when the track was repaved, the ditch was paved, and became the iconic turn of today, with the banking inside the turn, and the regular line above the crown. "Motor-racing is the only modern sport: Yes like other sports it pits man against man and the spiteful and often willful spirit of Fortune, but it is, ultimately, our marvelously damned attempt to dominate that which has no spirit that defines our sport as modern. It is man’s vainglorious attempt at defeating that which he has created in his own image—by nature both violent and fast—and testament to our desire to imitate the Father in dreaming of mortals possessed of a spirit able to arrest the mechanical carnage assured by our gun-metal past. It is, motor-racing, the metaphor of our age. Life, death, and fate enmeshed in that most human belief of a better tomorrow despite the dead-sure knowledge that a machine has no pity, feels no remorse, and will kill the brave and the the good and the cowardly and the evil with equal indifference. "We in Italy invented the automobile, both word and concept. It was in the 14th Century that the Sienese artist and engineer Simone Martini conceived of a 4-wheeled vehicle—powered by men—he dubbed an auto (from the Greek for ‘self’) mobile (from the Latin for ‘to move’). It may have taken us a further 300 years, but eventually we got around to translating Martini’s fantasy into reality with the first motorized automobile, too. That honor falls, depending on your way of thinking, either to Murnigotti in 1876, or Enrico Bernardi who, in 1880, affixed an internal combustion engine to his son’s tricycle. "We in Italy, moreover, provided the world with the first true stylists of the wheel, two men who defined how a grand prix car should be raced at speed. They are, to offer a parallel inconvenient and yet palpable, analogous to the first men to ride a bicycle, from whence we must distinguish the initial (English) pioneers and those (Italian) who perfected the art of riding that machine at speed and in competition. From these two stylists of the wheel stem, logically, the legendary names of Boillot, Werner, Constantini, Benoist, and—if it is permitted—those who we have lost, those heroes (always present!) who were slain by the machine that cares for nothing but blood, Antonio Ascari, Pietro Bordino, Gastone Brilli-Peri, Emilio Materassi, along with those who are still with us, winning prestige and honor for our nation week-in week-out around the world, Giuseppe Campari, Baconin Borzacchini, Clemente Biondetti, Luigi Fagioli, Nando Minoia. And in this discussion, we must end with the two men who currently stand unequalled and unparalleled in the world of speed, the unconditional progenies of those two proto-stylists of the wheel, Felice Nazzaro and Vincenzo Lancia—‘the Flying Mantuan’, Tazio Nuvolari, and ‘the Nobleman from Galliate’, Achille Varzi. "It was the belief of the ancients that the universe is divinely balanced: It is the Chinese who see life as balance between yin and yang, Hegel who will have his thesis and antithesis. And it is Varzi who will—must—have his Nuvolari as Lancia had his Nazzaro. "Where Achille Varzi is technique, Tazio Nuvolari remains—being his natural antithesis—pure reaction. The survivor of multiple shunts that would have seen a man of lesser providence dead (and a man of lesser fortitude retired), he has developed a tail-happy style in the tradition of Vincenzo Lancia and yet uniquely his own: His furious drifts allied to a consistently attacking demeanor does not capture, it is true, the spirit of the modern, but neither does it reflect back to the past despite his firm Catholic belief and traditional way of life: He is a force of nature, fearless and committed, a metaphor not of modernity, but of modern Italy. We have much to look forward to then as the grand prix circus begins its familiar tour of Europe: The Mille Miglia early in the spring (won this year by Nuvolari over Varzi) followed by the Targa Florio, Monaco, Spa in July, the Nürburgring in the dog days of summer, and our own Italian Grand Prix at Monza in the early autumn (while not forgetting the French Grand Prix slotted in somewhere between the summer or autumn, depending, as ever, on the whims of the Gallic disposition)." Tazio Nuvolari was an Italian Fascist hero who once admitted to never having experienced fear, and whose chosen destiny was to die on the tracks that he dominated in his Alfa Romeo. Life, though, would have a far more sinister hand to play: the man many regard as the greatest racing driver in history would live long enough to understand death: the death of friends and of fellow racers, but most of all, the death of those he loved the most. Achille Varzi was the taciturn, inscrutable Italian who became the world’s highest paid sportsman when he joined the Nazi-funded Auto Union team in January 1936. Twelve months later, he had stolen another man’s wife, lost his reputation along with his career, and vanished into the shadows of an opiate addiction that would almost claim his life. Hated by the Fascists, scorned by his fellow drivers, he was a man who thrived on the animosity he nurtured. Rudi Caracciola was the German ace known as the man without nerves, a man from nowhere who had escaped an act of brutal violence in his youth. His singular desire to be a race driver—allied with an indomitable spirit—saw him become one of the world’s top drivers by 1933. That was the year he put his Alfa into the wall at Monaco: By the time he left hospital seven months later, his nerves as shattered as his hip, he’d lost his career to younger men, and his wife to a skiing accident. Alone, constantly in pain, and with a limp from a leg that had almost been amputated, he set about re-building his life with an ice-cold determination. He remains the fastest man ever on a public road—a record that has not been bettered in 80 years. Bernd Rosemeyer was the youngest of the four, a provincial boy brought into the Auto Union team as much for his looks as for his talent. Blonde blue-eyed Bernd was a Nazi wet-dream, a member of the SS, and the very definition of the promise of Hitler’s youthful Reich. He was the most successful propaganda tool Goebbels ever had, Bernd the poster-boy, used to inspire the children of the Reich to conquer or die—and for the Nazis, a dead Bernd was more valuable than a live one. ̶ What happened to Elly Beinhorn and “Baby Bernd”? Elly Beinhorn died, aged 99, in 2007. Her and Bernd’s son is orthopaedist Dr. Bernd Rosemeyer. ̶ Rear-engined race cars were a new invention in the 1960s, right? Another common misconception is that the rear-engine revolution in race cars came into being in the 1960s in Britain. However, Auto Union and its chief designer, Dr. Porsche, had mid-engined race cars winning Grands Prix in 1935. It would take a world war and almost three decades before the motoring world rediscovered what Auto Union already knew back then. ̶ Did “Baby” Hoffman really invent the “spotter” at Indianapolis? Difficult to verify. The legend reads as follows: In 1929, Baby Hoffman and her lover Louis Chiron went to Indianapolis where Chiron was entered for the 500 in his Delage. In those days, women were not permitted in the paddock, and Hoffman, who was Chiron’s race chief, and angered at having to watch the race from the stands, had a scaffold constructed in the middle of the oval from where she monitored and timed the race. Chiron finished 7th. THE AUTHOR HAS SOUGHT TO ESTABLISH COPYRIGHT ON ALL IMAGES: IF YOU HAVE COPYRIGHT ON ANY OF THESE IMAGES, PLEASE CONTACT THE WEBSITE. THANK YOU.